The advance of laparoscopy has led to a surgical revolution that enabled surgeons to treat adrenal pathologies with decreased morbidity and offered patients the added benefit of an abbreviated convalescence. The use of laparoscopy in adrenal surgery is currently the standard of care, and many new surgical approaches are being actively developed. Meticulous surgical dissection and increasing surgeon experience will help maintain the current low complication rates. Surgery is by no means indicated for all adrenal lesions. The differential diagnosis is broad and includes benign nonfunctional adenoma, functional adenoma, pheochromocytoma, myelolipoma, adrenocortical carcinoma, and metastatic lesions. After an adrenal lesion is identified, it is imperative to determine the specific diagnosis. This is critical, in that the indications for adrenalectomy are twofold: tumor functionality and malignant potential. When an adrenal lesion is identified, the first question to be addressed is whether or not the lesion is hormonally active. 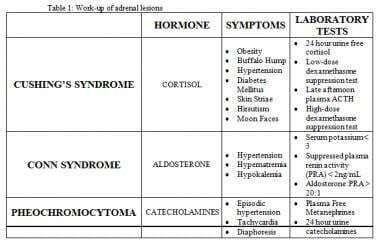 Adrenal lesions can secrete cortisol (Cushing syndrome), aldosterone (Conn syndrome), or catecholamines (pheochromocytoma). The chart below lists several tests used to determine the functionality of an adrenal pathology. Tests to determine functionality of adrenal pathology. When an adrenal lesion is determined to be hormonally active, extirpative therapy is indicated. Initially, open adrenalectomy was preferred in cases of suspected adrenocortical carcinoma. Today, however, there are few absolute contraindications for laparoscopic adrenalectomy. Laparoscopic approaches to the treatment of all adrenal pathologies have been successfully performed. [4, 15, 16, 17] As experience with laparoscopic adrenalectomy has increased, the absolute contraindications have dwindled. In current practice, laparoscopic adrenalectomy has generally been contraindicated in lesions 12 cm and larger. [17, 18] Nevertheless, the laparoscopic approach has been used in large adrenal masses up to 17 cm. In a report by Boylu et al,  the use of the laparoscopic approach in lesions larger than 8 cm resulted in longer operating times and higher blood loss but was comparable when hospital stay, open conversion rate, and pathologic outcome were compared. Throughout the literature, there are a plethora of papers describing surgical techniques used in extirpative therapy for adrenal lesions. The two most commonly used laparoscopic approaches are transperitoneal and retroperitoneal. Additionally, several authors have documented their experience with robot-assisted, [22, 23] laparoendoscopic single-site, [24, 25, 26, 27, 28, 29] natural orifice,  and transthoracic  techniques. The transperitoneal approach more closely mirrors the open approach to adrenalectomy and is the approach used at our institution. Accordingly, this topic concentrates on transperitoneal laparoscopic left adrenalectomy. Several adrenal pathologies necessitate extirpative management. Each of the individual pathologies carries risks that require attention preoperatively, intraoperatively, and postoperatively. Careful preoperative evaluation of patients with hormonally active adrenal lesions is critical. It is imperative that the surgeon has an understanding of adrenal physiology. Additionally, the consultation of anesthesiology, endocrinology, and (in some instances) cardiology is often helpful preoperatively. Patients with pheochromocytoma represent a uniquely difficult cohort. Preoperatively, these patients require pharmacologic alpha-adrenergic blockade, and often the addition of beta-adrenergic blockade, for adequate blood pressure management. Additionally, these patients tend to be significantly volume-depleted and can suffer from cathecholamine-induced cardiomyopathy. The judicious use of alpha blockers preoperatively can facilitate the expansion of blood volume in these patients in a controlled fashion. In addition to the adrenal-specific concerns, patients require standard precautions preoperatively. Patients should receive a mechanical bowel preparation with only clear liquids on the day before surgery. Broad-spectrum perioperative antibiotics should be administered within 1 hour of incision, and standard deep vein thrombosis prophylaxis with stockings and pneumatic compression devices, with or without subcutaneous heparin, should be initiated prior to the induction of anesthesia. Gagner M, Lacroix A, Bolte E. Laparoscopic adrenalectomy in Cushing's syndrome and pheochromocytoma. N Engl J Med. 1992 Oct 1. 327(14):1033. [Medline]. Brunt LM, Doherty GM, Norton JA, Soper NJ, Quasebarth MA, Moley JF. Laparoscopic adrenalectomy compared to open adrenalectomy for benign adrenal neoplasms. J Am Coll Surg. 1996 Jul. 183(1):1-10. [Medline]. Hazzan D, Shiloni E, Golijanin D, Jurim O, Gross D, Reissman P. Laparoscopic vs open adrenalectomy for benign adrenal neoplasm. Surg Endosc. 2001 Nov. 15(11):1356-8. [Medline]. Assalia A, Gagner M. Laparoscopic adrenalectomy. Br J Surg. 2004 Oct. 91(10):1259-74. [Medline]. Schell SR, Talamini MA, Udelsman R. Laparoscopic adrenalectomy for nonmalignant disease: improved safety, morbidity, and cost-effectiveness. Surg Endosc. 1999 Jan. 13(1):30-4. [Medline]. Winfield HN, Hamilton BD, Bravo EL, Novick AC. Laparoscopic adrenalectomy: the preferred choice? A comparison to open adrenalectomy. J Urol. 1998 Aug. 160(2):325-9. [Medline]. Yoshimura K, Yoshioka T, Miyake O, Matsumiya K, Miki T, Okuyama A. Comparison of clinical outcomes of laparoscopic and conventional open adrenalectomy. J Endourol. 1998 Dec. 12(6):555-9. [Medline]. Grumbach MM, Biller BM, Braunstein GD, et al. Management of the clinically inapparent adrenal mass ("incidentaloma"). Ann Intern Med. 2003 Mar 4. 138(5):424-9. [Medline]. Murphy MM, Witkowski ER, Ng SC, et al. Trends in adrenalectomy: a recent national review. Surg Endosc. 2010 Oct. 24(10):2518-26. [Medline]. Hussain S, Belldegrun A, Seltzer SE, Richie JP, Gittes RF, Abrams HL. Differentiation of malignant from benign adrenal masses: predictive indices on computed tomography. AJR Am J Roentgenol. 1985 Jan. 144(1):61-5. [Medline]. Schteingart DE, Doherty GM, Gauger PG, et al. Management of patients with adrenal cancer: recommendations of an international consensus conference. Endocr Relat Cancer. 2005 Sep. 12(3):667-80. [Medline]. Belldegrun A, Hussain S, Seltzer SE, Loughlin KR, Gittes RF, Richie JP. Incidentally discovered mass of the adrenal gland. Surg Gynecol Obstet. 1986 Sep. 163(3):203-8. [Medline]. Bornstein SR, Stratakis CA, Chrousos GP. Adrenocortical tumors: recent advances in basic concepts and clinical management. Ann Intern Med. 1999 May 4. 130(9):759-71. [Medline]. Rieder JM, Nisbet AA, Wuerstle MC, Tran VQ, Kwon EO, Chien GW. Differences in left and right laparoscopic adrenalectomy. JSLS. 2010 Jul-Sep. 14(3):369-73. [Medline]. [Full Text]. Shen WT, Grogan R, Vriens M, Clark OH, Duh QY. One hundred two patients with pheochromocytoma treated at a single institution since the introduction of laparoscopic adrenalectomy. Arch Surg. 2010 Sep. 145(9):893-7. [Medline]. Brix D, Allolio B, Fenske W, et al. Laparoscopic versus open adrenalectomy for adrenocortical carcinoma: surgical and oncologic outcome in 152 patients. Eur Urol. 2010 Oct. 58(4):609-15. [Medline]. Gumbs AA, Gagner M. Laparoscopic adrenalectomy. Best Pract Res Clin Endocrinol Metab. 2006 Sep. 20(3):483-99. [Medline]. Boylu U, Oommen M, Lee BR, Thomas R. Laparoscopic adrenalectomy for large adrenal masses: pushing the envelope. J Endourol. 2009 Jun. 23(6):971-5. [Medline]. Schulick RD, Brennan MF. Long-term survival after complete resection and repeat resection in patients with adrenocortical carcinoma. Ann Surg Oncol. 1999 Dec. 6(8):719-26. [Medline]. Schulick RD, Brennan MF. Adrenocortical carcinoma. World J Urol. 1999 Feb. 17(1):26-34. [Medline]. Boris RS, Gupta G, Linehan WM, Pinto PA, Bratslavsky G. Robot-assisted laparoscopic partial adrenalectomy: initial experience. Urology. 2011 Apr. 77(4):775-80. [Medline]. [Full Text]. Lee GS, Arghami A, Dy BM, McKenzie TJ, Thompson GB, Richards ML. Robotic single-site adrenalectomy. Surg Endosc. 2016 Aug. 30 (8):3351-6. [Medline]. Chung SD, Huang CY, Wang SM, Tai HC, Tsai YC, Chueh SC. Laparoendoscopic single-site (LESS) retroperitoneal adrenalectomy using a homemade single-access platform and standard laparoscopic instruments. Surg Endosc. 2011 Apr. 25(4):1251-6. [Medline]. Zhang X, Shi TP, Li HZ, Ma X, Wang BJ. Laparo-endoscopic single site anatomical retroperitoneoscopic adrenalectomy using conventional instruments: initial experience and short-term outcome. J Urol. 2011 Feb. 185(2):401-6. [Medline]. Cindolo L, Gidaro S, Neri F, Tamburro FR, Schips L. Assessing feasibility and safety of laparoendoscopic single-site surgery adrenalectomy: initial experience. J Endourol. 2010 Jun. 24(6):977-80. [Medline]. Vidal O, Astudillo E, Valentini M, Ginestá C, Espert JJ, Gracía-Valdecasas JC, et al. Single-port laparoscopic left adrenalectomy (SILS): 3 years' experience of a single institution. Surg Laparosc Endosc Percutan Tech. 2014 Oct. 24 (5):440-3. [Medline]. Sho S, Yeh MW, Li N, Livhits MJ. Single-incision retroperitoneoscopic adrenalectomy: a North American experience. Surg Endosc. 2016 Nov 8. [Medline]. Chai YJ, Woo JW, Kwon H, Choi JY, Kim SJ, Lee KE. Comparative outcomes of lateral transperitoneal adrenalectomy versus posterior retroperitoneoscopic adrenalectomy in consecutive patients: A single surgeon's experience. Asian J Surg. 2016 Apr. 39 (2):74-80. [Medline]. Perretta S, Allemann P, Asakuma M, Dallemagne B, Marescaux J. Adrenalectomy using natural orifice translumenal endoscopic surgery (NOTES): a transvaginal retroperitoneal approach. Surg Endosc. 2009 Jun. 23(6):1390. [Medline]. Gill IS, Meraney AM, Thomas JC, Sung GT, Novick AC, Lieberman I. Thoracoscopic transdiaphragmatic adrenalectomy: the initial experience. J Urol. 2001 Jun. 165(6 Pt 1):1875-81. [Medline]. Gockel I, Kneist W, Heintz A, Beyer J, Junginger T. Endoscopic adrenalectomy: an analysis of the transperitoneal and retroperitoneal approaches and results of a prospective follow-up study. Surg Endosc. 2005 Apr. 19(4):569-73. [Medline]. Rubinstein M, Gill IS, Aron M, et al. Prospective, randomized comparison of transperitoneal versus retroperitoneal laparoscopic adrenalectomy. J Urol. 2005 Aug. 174(2):442-5; discussion 445. [Medline]. Tai CK, Li SK, Hou SM, Fan CW, Fung TC, Wah MK. Laparoscopic adrenalectomy: Comparison of lateral transperitoneal and lateral retroperitoneal approaches. Surg Laparosc Endosc Percutan Tech. 2006 Jun. 16(3):141-5. [Medline]. Naya Y, Nagata M, Ichikawa T, et al. Laparoscopic adrenalectomy: comparison of transperitoneal and retroperitoneal approaches. BJU Int. 2002 Aug. 90(3):199-204. [Medline]. Berber E, Tellioglu G, Harvey A, Mitchell J, Milas M, Siperstein A. Comparison of laparoscopic transabdominal lateral versus posterior retroperitoneal adrenalectomy. Surgery. 2009 Oct. 146(4):621-5; discussion 625-6. [Medline]. Sartori PV, Romano F, Uggeri F, et al. Energy-based hemostatic devices in laparoscopic adrenalectomy. Langenbecks Arch Surg. 2010 Feb. 395(2):111-4. [Medline]. Surgit O. Clipless and sutureless laparoscopic adrenalectomy carried out with the LigaSure device in 32 patients. Surg Laparosc Endosc Percutan Tech. 2010 Apr. 20(2):109-13. [Medline]. Gupta PK, Natarajan B, Pallati PK, Gupta H, Sainath J, Fitzgibbons RJ Jr. Outcomes after laparoscopic adrenalectomy. Surg Endosc. 2011 Mar. 25(3):784-94. [Medline]. Strebel RT, Müntener M, Sulser T. Intraoperative complications of laparoscopic adrenalectomy. World J Urol. 2008 Dec. 26(6):555-60. [Medline]. Cianci P, Fersini A, Tartaglia N, Altamura A, Lizzi V, Stoppino LP, et al. Spleen assessment after laparoscopic transperitoneal left adrenalectomy: preliminary results. Surg Endosc. 2016 Apr. 30 (4):1503-7. [Medline]. Henry JF, Defechereux T, Raffaelli M, Lubrano D, Gramatica L. Complications of laparoscopic adrenalectomy: results of 169 consecutive procedures. World J Surg. 2000 Nov. 24(11):1342-6. [Medline]. Nau P, Demyttenaere S, Muscarella P, et al. Pheochromocytoma does not increase risk in laparoscopic adrenalectomy. Surg Endosc. 2010 Nov. 24(11):2760-4. [Medline]. Laparoscopic left adrenalectomy: trocar placement.